National Instruments has announced multiple antenna User Equipment (UE) support for its LabVIEW Communications MIMO Application Framework. This makes this solution the world’s only commercially available physical layer reference design that powers true Massive MIMO prototyping that goes beyond just desktop simulations to fully functional 5G deployments. 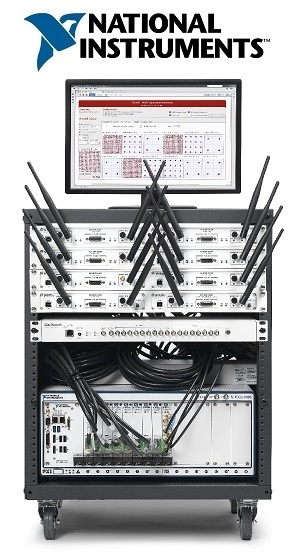 With this solution, wireless researchers can pair the MIMO Application Framework with NI software defined radio hardware to conduct real-time, over-the-air experiments for a wide range of MIMO research topics including multi-user MIMO, single-user MIMO and Massive MIMO. This multi-FPGA physical layer reference design ships with well-documented LabVIEW Communications source code that is fully reconfigurable and modifiable, making it possible to create a complete network of multiple antenna devices with minimal system integration or design effort. As participants in NI’s RF/Communications Lead User program, wireless researchers at Lund University in Sweden have used NI’s flexible prototyping platform for 5G research and have recently demonstrated the feasibility of Massive MIMO under mobile conditions for users moving at both pedestrian and vehicular speeds. Click here to learn more about the MIMO Application Framework from NI.